You can hardly accuse Triumph of rushing into the big adventure bike market. They’ve been incubating and hatching the 1200 Tiger Explorer since July 2006. Yes, since before the World went into financial freefall. But the gestation wasn’t helped by the fact that they had to design and build a brand new engine as well as a brand new bike. 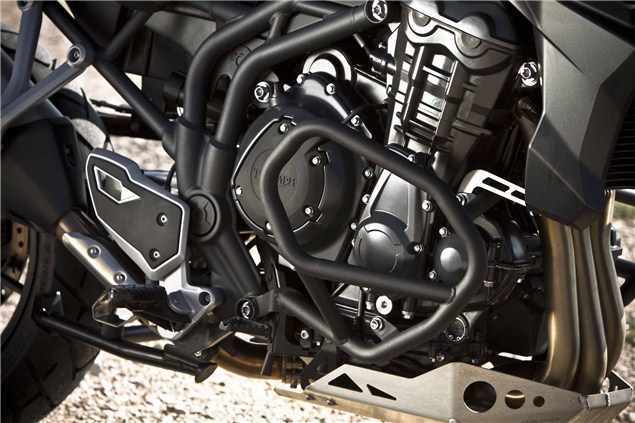 The Explorer’s 1215cc three-cylinder motor shares no parts and no dimensions with any other engine in the current Triumph range. It is a clean sheet. Brand spankin' new. Having ridden the rival’s offerings first it was clear to the Triumph design team from the offset that it wasn’t going to be possible to pluck an engine from the existing range and adapt it for use in the new adventure bike. Torque and power characteristics are one thing but 10,000 mile service intervals, a 950W generator and shaft final drive are another thing altogether. From the onset, the design-goals were clear. The new bike had to be comfortable and easy to use for two people, it had to be durable and reliable and it had to be bristling with gadgets. Or as they say in the car trade, fully loaded. The engine has been designed to have as few external oil and water pipes as possible. This may be bad news for Samco but it’s good news for owners – especially in terms of reliability and ease of servicing. 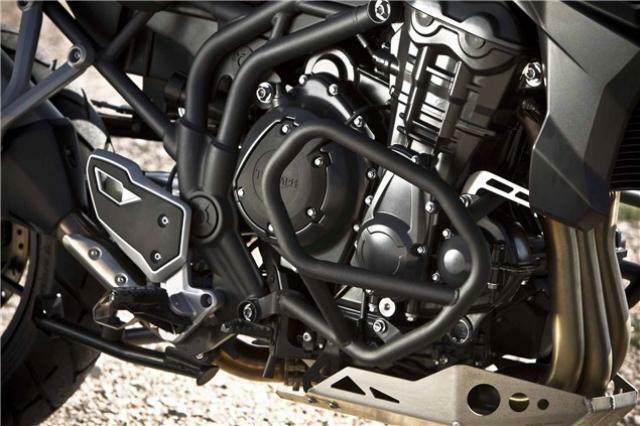 Those three (of course) cylinders run 85x71.4mm bore and stroke dimensions and a full ride-by-wire Keihin fuel injection system takes care of a number of important aspects such as European emissions laws, cruise control, traction control and capping the top speed to 220kmh (for hard-luggage stability issues). The double overhead camshafts are driven by a durable chain. A 950w alternator nestles behind the cylinders and employs a free-wheel device so on reverse loads it keeps spinning (and producing power) and avoids the kind of forces that tend to trouble fast-spinning bearings. Besides, putting an alternator this size on the end of the crankshaft would have made the engine very wide. An external flywheel sits under the nearside engine casing where the alternator ‘should’ be. 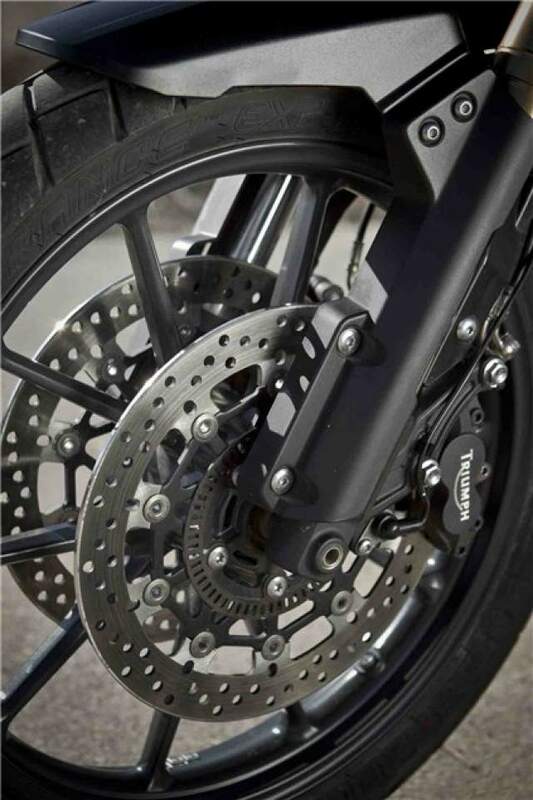 Not only is the alternator capable of powering a small hamlet, but so too is the battery – just the job if you’re going to leave your bike idle for weeks or months in between rides or plug heated underclothing in for hours at a time. Power? 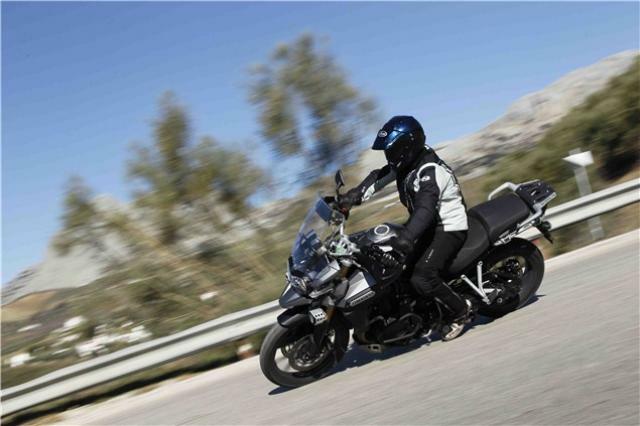 Triumph claim a peak figure of 137PS and – the most crucial part – a peak torque figure of 121Nm delivered at 6,400rpm. Before I get on to the riding part let me tell you this: the 1200 Explorer comes, as standard, with traction control, ABS, cruise control and heated grips. I’ll have to tell you about the raft of optional extras in a totally different story as they're so expansive. I only got four hours on the bike so my findings are by no means conclusive but having spent a few weeks on BMW’s big GS at the tail end of last year and a day on Honda’s new Crosstourer last week I got long enough on the Explorer to form some opinions. At a claimed 260kgs wet the Tiger Explorer is no lightweight but it’s 10 kilos lighter than the Crosstourer. But both are big bikes that hide their weight well as the centre of gravity is noticeably lower than BMW’s monster-tall GS. Just paddling around the car park I felt comfortably in control of the Explorer and even doing u-turns on rocky gravel it never felt like it was going to get the better of me. The riding position helps here, too. You’re sat ‘in’ the bike with plenty of space and even with short legs it’s easy to get your feet on the floor because the back of the tank’s so narrow. The seat has two height positions (optional saddles offer a seat height range from 810mm to 880mm!) and the footrests are mounted low enough to create some leg space to avoid cramps. Jab the starter button and the big triple whines into life. It’s responsive and smooth and sounds great when you apply some revs – a nice balance between not too noisy and not too quiet. The standard end can produces a real rasp under load but in no way would it become tiringly noisy on a long run. The hydraulic clutch action is as light as the throttle and first gear snicks home quietly. The shaft drive system is so slick and unobtrusive, you'd swear it was a chain driving the back wheel. 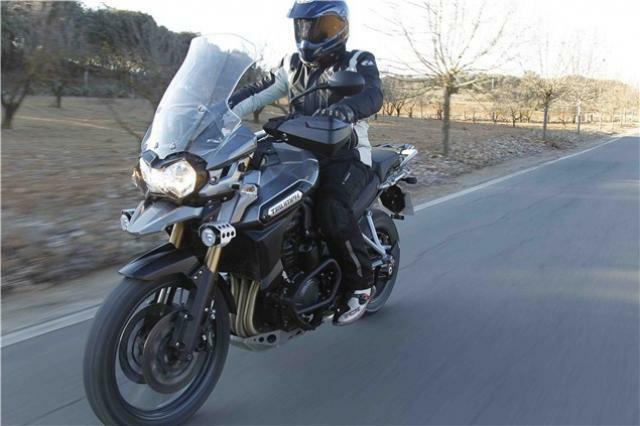 Hardly surprisingly bearing in mind its 1215cc, the Explorer pulls hard from low down. The torque delivery isn’t as rip-your-arms-out as the Honda Crosstourer from idle speeds but the engine really feels to get into its purple patch at around 5-6,000rpm and this is where I seemed to be spending most of my time, especially when we upped the pace a bit. The poorly surfaced, shiny roads may not have been the best place to check out Metzeler’s Tourance EXP tyres (17in rear, 19in front) but it did let me try out Triumph’s ABS and traction control a few times. It works well. If you don’t want either of these systems, you can disable them using the clever dashboard menu system. Brakes? One finger operation is more than adequate. Masses of power, masses of feel. Click here for page 2 of 2 of the Triumph Tiger Explorer review.